(DVD + CD set) This Goossens/LSO recording by Bert Whyte for Everest at Walthamstow Assembly Hall in London was originally released in February 1960. 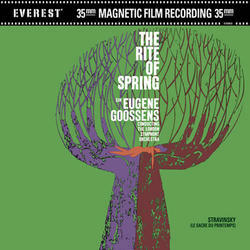 As the liner notes point out, "Stravinsky has painted these Pictures of Pagan Russia, as he subtitled the work, with bold strokes on a huge orchestral canvas" which has never been more evident sonically than on this recording and the 35mm sound which has a textural richness that is more realistic than any other tape format. Includes a bonus CD remastered. HDAD Plus is a 2-sided hybrid disc that will play in 24/96kHz on a standard DVD video player (no footage included) and in 24/192kHz on a DVD audio player.